Definition- Hello is a salutation or greeting in the English language. It is first attested in writing from 1826. 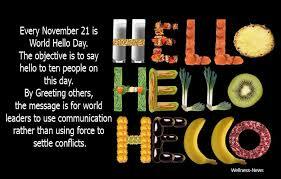 World Hello Day encourages us to take the opportunity to simply greet people. As well as to recognize how important simple communication is in our daily lives. Although, the story of how it came to be, however, is a long and interesting one. World Hello Day was first created in 1973 in order to show people, especially the people of the Middle East that conflicts can and should be resolved through communication, and not violence. The idea was that, honest communication breeds peace. Similarly, now we celebrate it all over the world to remind us, that peace could start with a simple hello. Participating in on this special day is quite simple. Just smile and say hi to at least 10 people during that one day. This is supposed to send a message of openness and goodwill to others, and the creators of the holiday hoped this small gesture alone would demonstrate how communication can be instrumental in resolving disputes and preventing conflicts.